Honey is a wonderful sweetener for ice cream, giving it a nice mellow sweetness. It also happens to be a perfect pairing with figs. So, honey & fig ice cream makes a lot of sense. I decided to also add pistachio for a bit of crunch (the figs seed add some texture too). Plus I think of figs & pistachios going together in Middle Eastern cuisine. This is a rich, creamy ice cream that gets a pale yellow color from the honey & figs (though if you used a fig with a pink center like the Brown Turkey, you'd get a pinker ice cream probably). I like the fact the flavor is really subtle & not overly sweet. I used really ripe fresh figs for this recipe. Because they are pretty mushy they get very incorporated into the ice cream. If you can't get fresh figs go ahead & use some chopped dried. They will ended up being scattered throughout the ice cream instead of incorporated into it but it'll still taste fabulous. Whisk the egg yolks & honey together until thick & light yellow then set aside. In a medium saucepan, bring the cream & milk to a simmer over medium-high heat. Whisk a little at a time into the egg mixture to temper it. Return to the saucepan. Cook over low heat, stirring all the time, until the mixture is thick. You want it to be able to coat the back of a spoon. Strain into a clean container. Stir in the vanilla. Cover & refrigerate until completely cold. Process according to the directions on your ice cream maker. Add the figs & pistachio during the last 5 minutes of processing. Serve as a soft ice cream or freeze for a harder set. Don't forget to enter to win your own bounty of fresh & dried figs from the CA Fig Advisory Board! Woke up to steamy, humid morning. 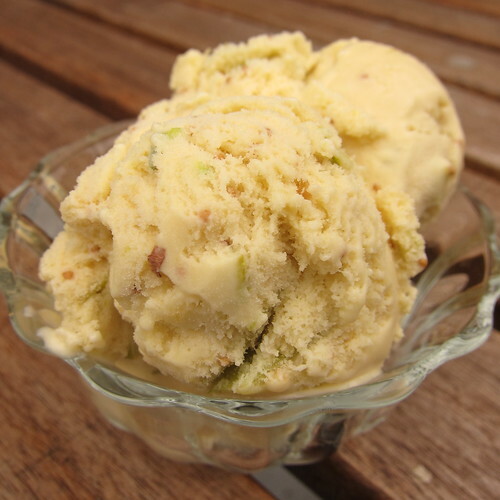 How I would dearly love a big scoop of this honey fig pistachio ice cream! Oh my GOD. I am so jealous of your figs! That icecream makes me not want to go on living without it. Oh my GOD. This sounds like an amazing combination, I can only guess how great this tastes! What a challenge with your stove! Hope things are back to normal soon! ooh! i like how the pebbly pistachios add a touch of color, too--great, great combination! This is a great idea for ice cream! I could see myself buying figs just to make this recipe! I am so jealous of your figs! All the recipes you have made with them look absolutely divine. Fresh figs aren't very easy to find around here. Now I'm really wishing that they were!! I seldom see pistachio ice creams in many restaurants and shops. I think it is a very delicious flavor for an ice cream. What a very nice flavor for an ice cream! This is really something nice! I want to try this one.